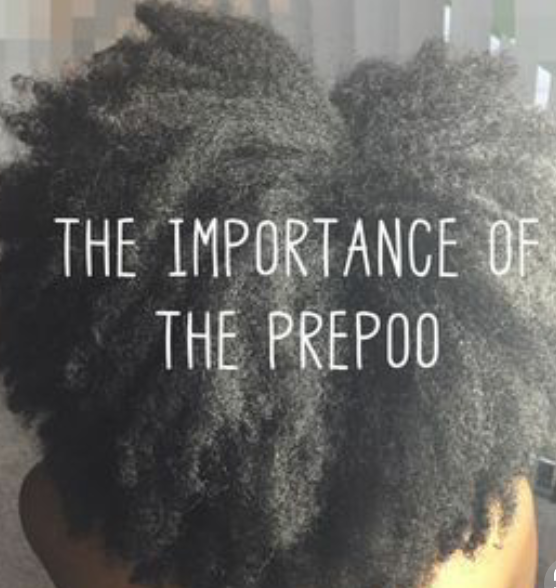 Prepoo or Pre Shampoo is a treatment done before you shampoo your hair, it Is good for all types of natural hair. ■ Divide your hair in 4 or more sections. ■ Heat a light oil or oils ( cocunot oil, almond oil, avocado oil,olive oil, jojoba oil). ■ Spray WARM WATER on your hair either you are high or low porosity. ■ Apply the warm oil on each section of your hair from your scalp to your hair roots and tips, saturate it well, massage the oil in your scalp and hair section then twist that section and move to the next section. ■ Cover your head with a plastic cap and then your bonnet to steam your hair for one hour or even the whole of the night. ■ After the steaming you can now detangle your hair section by section with your fingers or a wide tooth comb, you’ll notice your hair will be so easy, faster to detangle and will break less. ■ Now you are ready to shampoo your hair, focus more on your scalp and do it section by section. After the shampoo your hair will feel less dry, softer and have maintain elasticity. Prepooing have hanged my natural hair game and if I can now skip deep conditioning for 2 or 3 wadsh days, there’s no way I’ll skip prepoo. For the past two months I’ve started prepooing with onion and garlic oil ( almond and olive oil infused with onion and garlic)! What do you use to prepoo? Do you prepoo?